Casper Mattress Review – How Does it Really Perform? Every person on earth spends a vast proportion of their life sleeping, so when it's time to purchase a mattress, it is an important decision to make as it has a significant impact on your overall health and wellbeing. A mattress that suits your sleeping style will have you waking up in the morning feeling revitalised and refreshed ready to attack the day. Mattress buying is traditionally a long, difficult process and it has been accepted as the only method for decades and decades. However, there has been an industry shake-up which has been more noticeable over the last few years, which has transferred this process offline to online making a simple to purchase a mattress. At a glance, it may seem more challenging to order a mattress online because you don't get to lie on it first. However, when you lie on a mattress in a showroom, lying on it for 30 seconds isn't going to give you a good indication of whether you like it or not as it can often take a few days to get used to a new mattress. To help you through this buying process we have created a detailed Casper mattress review, so you know the pros, cons, what to expect and whether it lives up to its strong reputation. Casper is an award-winning innovative mattress maker who have the sole aim of creating the perfect mattress. From design to manufacturing to distribution, the customer has been at the forefront of any business decision. Throughout every stage of the process. volunteers have tested and reviewed prototypes to ensure that every part of the mattress provides a benefit to the user. Although Casper is originally a US company, the materials are UK sourced, and the mattresses are assembled and distributed from within the UK. Because they aren't like a traditional mattress company with huge showrooms, huge inventory commissioned salespeople and unreasonable shipping costs it means that they can pass the savings on to the customer which means lower selling prices. Also, it means that your mattress hasn't been sat on a showroom floor or in a poorly maintained retail store warehouse, but it has been freshly shipped right from the manufacturing line. Very early into the product development stage, Casper highlighted four key areas that have the most significant impact on sleep quality: comfort, support, temperature and durability. It led to the creation of 12 final prototypes with different qualities; these were then tested by users until there was only one left: the 'perfect" mattress. The mattress is made up of 4 unique layers that work together to bring you the ultimate sleeping experience. The top surface of the mattress is a breathable comfort layer that promotes airflow to keep you cool but also has the ideal amount of bounce. The open cell design increases circulation and allows for air to pass freely underneath your body. The second layer is made up of high-quality density memory foam which not only provides pressure relief to your joints soothing any aches and pains but also contours to the shape of your body even if you move and change position throughout the night. This gives the mattress the perfect level of spring and bounce. It is often referred to as the transition layer, and provides a deeper level of comfort but also works to distribute your body weight across the mattress equally. This is especially important for the vulnerable parts of your body such as the spine. This support base layer forms the strong base for the mattress and not only strengthens the top layers but also adds durability to the mattress which allows it to last many years. The mattress is then finished off and covered in a single piece seamless plush polyester zipped cover that feels just as good as it looks. The cover is also porous to promote a healthy level of airflow and breathability. As sad as it sounds, but this was a huge part of the excitement for me, as I have endured too many long days trekking around mattress showrooms and the fact that I wouldn't have to do this brought me a great sense of relief. It's as simple as any other online transaction then its a case of sitting back, relaxing and waiting for it to be delivered. Because Casper only has one product and type of mattress, the buying process is even easier as there are no additional decisions to make such as choosing the exact firmness or other add ons that often bring no benefits but make you spend even more money. Like most of the new age online mattress company start-ups, the mattress is delivered in a vacuum-packed air-sealed state. It's always initially surprising that they manage to roll and squeeze such a large mattress into a small box that measures only 47 x 47 x 106cm. And its free delivery! 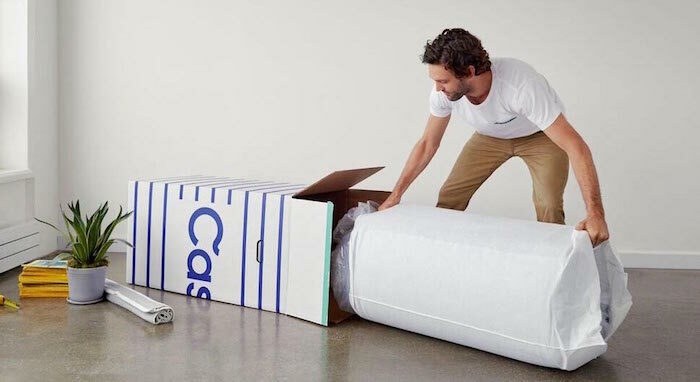 Because the Casper mattress is constructed using high-quality resilient foams, they can be compressed by machine without losing any of its qualities and benefits. During the compression process, no pressure is placed on any part of the sleeping surface. Being shipped in a box makes it extremely easier to get the mattress into your desired room as you don't need to navigate up narrow staircases. It only requires a couple of hours to expand into its original shape fully and then it's ready to use. First of all the most important thing to comment on is its firmness, as similar to all online mattress companies they shy away from comparing their mattresses to a universal scale as they are trying to create the perfect mattress that is suitable for all preferences. If the Casper were to sit on a firmness scale, it would be at a 6.5 in my opinion. When you sleep on the Casper mattress, you will feel the pressure relieving soft memory foam contouring around your body that provides a small level of sink but not an overwhelming amount. Beneath the memory foam, you will then feel the foundation support level being activated to provide firmness to your body. You can feel the benefit of the top outer layer being breathable and promoting airflow as it's a common issue with memory foam that it overheats and becomes uncomfortable for the user. This isn't a problem with the Casper mattress that promotes, so you don't wake up in the middle of the night in a pool of sweat. A lot of mattress companies claim to design their mattress with couples in mind, but this mattress delivers in this regard. Despite there being a comfortable level of bounce there is still a low amount of isolated motion transfer so even if your partner is moving next to you then you won't feel anything. As somebody who tends to sleep in many positions throughout the night, it's great to finally have a mattress on the market that caters to all people no matter if they sleep on their back, front or side. However the level of sink that you experience will be proportional to your weight, so the heavier you are, the more sink you will feel. So, the heavier you are, the firmer the mattress will feel as the firmer foundation level activates more. The effect of the Casper mattress on your sleep will be extremely noticeable in a short period, especially if your previous mattress is older. The four-layer system is what makes it suitable for a range of different people with different sleep styles. This has created a lovely hybrid mattress that is not too hard, too soft, too hot or too cold. Casper has also eliminated to common issues that are often experienced with memory foam while improving the benefits. The 100-day guarantee is beginning to become a standard offering by online mattress companies, and Casper was one of the pioneers of this approach which has seen many competitors follow. In simple terms, you have 100 days from purchase to use the product, and if you still aren't happy with your purchase, Casper will come and collect the mattress free of charge, and you will receive a full refund. Following on from the 100-day guarantee if you decide to keep the mattress long term, you're covered by a 10-year manufacturer warranty, so if your mattress develops any defects or faults, Casper will either repair or most likely replace. This provides you added peace of mind that you don't get with many traditional mattress companies where the warranty will usually be around five years. Casper does not just develop mattresses but also have a range of pillows and duvets that compliment the qualities of the mattress. The additional products will further enhance your sleep. A poor quality pillow is often the underlying reason for poor quality sleep so in many cases it would be recommended to replace your pillow at the same time as your mattress. The pillows function similar to the mattress and feature a responsive contouring design to support your neck and head, while the duvet is made from breathable premium cotton. The Casper mattress can fit any bed frame and can also be used directly on the floor. This means that although you have to buy a new mattress, you don't need to spend additional money on a special bed frame to accommodate the mattress. I don't see this as an issue because it makes the buying process more manageable. However, some customers are extremely educated and have an exact idea of the type of mattress that they want. Casper does not provide this level of personalisation, but the average person will enjoy the Casper mattress. Additionally, if you need a mattress at either end of the scale, so either extremely soft or hard then this may not be the mattress for you. When the Casper mattress was launched a few years ago, it was installed as the number 1 company due to there being lack of competition. Fast forward to the present time there are now more than half a dozen UK based companies now selling a similar offering of a hybrid mattress shipped in a box that is suitable for everyone. One potential drawback of competitors is the fact that although they offer a 10-year guarantee, we don't know if the company will even still be trading then. 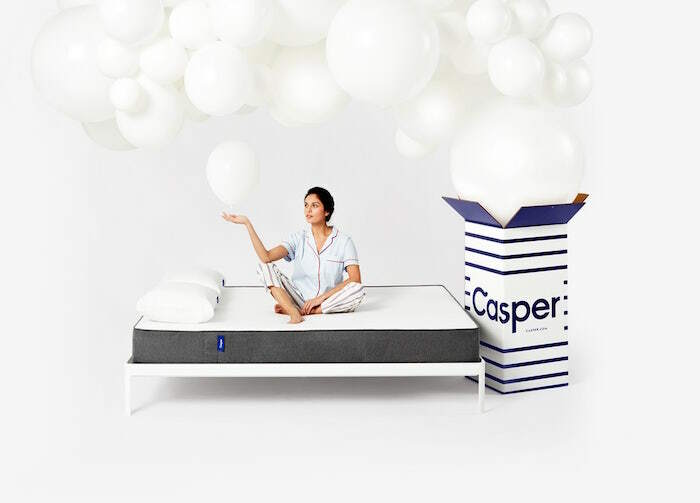 However, Casper has been around for many years now and look to be here to stay especially as a result of gaining a $55 million investment in 2015 to meet the demand for their mattresses. Having to order the mattress online should not be seen as negative because of the 100-day trial and ten-year guarantee. Also because as humans we order different things online all the time, and every time there is a bit of a gamble but the majority of the time it pays off and will save you a significant amount of money. Although we recommend the product through this Casper mattress review, you can't ignore the hugely positive response that has been generated by the thousands of customers and reviews for the product. This is despite it costing three times less than they would if they were sold in a traditional showroom. Of course, if you're comparing this to a £2,000 Tempur mattress, it doesn't quite match up, but compared to the majority of mattresses within its price range, especially in-store, it's one of the top performers. It's fair to say that all the media attention that the Casper mattress has received over the last 2-3 years is entirely justified.